This map is from MA Dept. of Environmental Protection Wetlands data for these habitats: wooded swamp deciduous, wooded swamp coniferous and wooded swamp mixed trees. Forested wetlands, otherwise known as forested swamps, are freshwater wetlands dominated by trees. Throughout much of Massachusetts, forested wetlands are dominated by red maple and eastern hemlock, but also support a range of other species such as white and green ash, pin and swamp white oak, yellow birch, and black gum. Large river floodplains often support floodplain forests that are characterized by eastern cottonwood and silver maple. 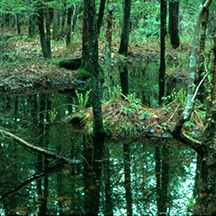 Atlantic white cedar swamps are a relatively rare forested wetland type that is most common along the coast, but also occurs in the Connecticut River valley.